About Us. We are the Leading supplier for Vacuum packing Machine and Vacuum Sealers. We also stock a large range of vacuum bags and accessories. All products we supply are made in Germany. We are a small, family company that has been trading as Coolgame UK Limited since 2007 when we started out selling game fridges and larders from our German supplier, Manfred Landig. The company has grown over the years and now includes a range of, high quality, home and commercial table top vacuum sealers branded Lava, which have been sold into many homes, hotels, catering companies and industries. Manufactured in Germany by our sole supplier, Manfred Landig, the products come highly recommend due to their build quality, heavy duty pump and backed by a two year warranty. The company continues to expand its business offering other products and accessories for vacuum packing. These include a vast range of embossed ribbed vacuum bags and rolls at very competitive prices, vacuum acrylic containers and stainless steel bowls as well as the innovative “liquid stop”. 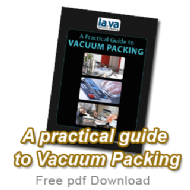 Lava Vacuum Packing is particularly committed to offering a “one-stop shop” to home enthusiasts and professional chefs alike, focussing on cooking trends such as sous-vide cooking. That’s why our range of vacuum bags and rolls are perfect for this job. We supply to a wide range of customers from hotels, fine dining restaurants, caterers, food processors, artisan producers, fine food shops, delicatessens and farm shops through to home consumers. We also sell to many non-food based customers who use vacuum packing in many diverse applications such as pharmaceuticals, electronics, engineering and cushion manufacturers. We already have the Lava vacuum sealers behind the deli-counters of Selfridges, who find the process of vacuum packing cooked meats, cheeses etc. an ideal solution for the consumer. We are more than happy to discuss your requirements whether it’s within the food or non-food industry and are able to modify or produce exclusive models for a particular requirement. Please don’t hesitate to contact us by email or phone - we’re not just one of those “other” internet companies where you can’t get to speak to anyone!! Our supplier in Germany, Manfred Landig, is committed to manufacturing quality products and sourcing quality components. These include our powerful pumps to the highest food grade embossed vacuum bags and rolls. Manfred Landig are the number one suppliers of external vacuum bag sealers in Europe. All Landig Game Fridges, Lava vacuum sealers and La-vide water baths should be disposed of correctly. As such we are compliant with current WEEE regulations. Our Environment Agency registration number is WEEE/HJ0491TV.